Our 2017 banquet event for the children and families of every1plays has been something we’ve been planning for over a year. On February 2, 2017 every1plays hosted a banquet for parents and children of Team USA to announce the new team name, logo, and to give children their new jerseys for city league play. We also invited participants and their families that have been attending practices. We all enjoyed a lot of food thanks to the coaches and parents to prepare for the announcement. For over a year, we discussed plans to change the team name. The Team USA name goes back to when some of the children first started playing organized basketball more than five years ago. Team USA also goes back to the first years of Joshy’s coaching experience. The team USA club was started by a group of coaches at Album Park’s city league when current players Ethan & Adrian started hooping. Back in 2008, I took a picture of my brother as we made our way out from the NBA preseason game at the Don Haskins Center. On my FB page I remember titling this shot, “Hoop Dreams” inspired by the Ben Joravsky book turned into a documentary by the same name in the 90s. Afterwards I reached out to graphic design artist Luis Flores for his assistance on a logo inspired by the shootout uniforms from Above the Rim. After a few emails back and forth Luis sent the final proof and we had the new team logo design ready to go. It would take several months until I’d figure out how we were going to print up the jerseys. 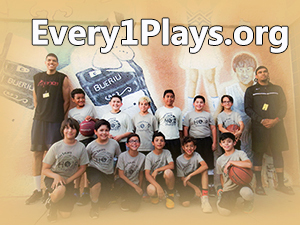 From the get go I wanted to make sure that we could provide each participant of every1plays with a free jersey. Especially for those that had already paid for a Team USAB jersey. I met with a few folks in town about how to print up the jerseys in a way that resembled the All Star Rookie jerseys that I saw back in February. They had a cold fade leading down into the shorts that I was hoping we could create for the every1plays kids. As time went by, the process seemed a lot more complicated and costly than I imagined. Fast forward a few months after one of the Scotsdale Cadet city league games and Coach Joshy, Coach Isaiah, myself, and the two Ethans took a ride down to La Estrella Screen Printing and Embroidery on Zaragoza. With the logo on a thumb drive we found out that it would be much cheaper to print t-shirts instead of jerseys. We decided on two colors, black (away color) and beige (home color). With a quote on the cost, it was time to find a sponsor. Because of our history at RXN Athletics, Reaction Therapy, and their connection to some of our kids, it made perfect sense to approach them for sponsorship support. We’re excited to be able to hit the court with their logo branded on the back of our jerseys. We were able to prepare the jerseys in time for the new year 2017 thanks to La Estrella who also provided assistance on the appearance of the logo and design. On February 2, 2017, we provided participants with their own Hoop Dreams jersey in both black and beige and shared thoughts on the upcoming city league and future goals for every1plays. Coach Joshy also gave each player resume letters in recognition of their participation and to inspire goals for future hoop whether its with us or other city and school teams. February 2, 2017 was a memorable evening, and like any other day it seems to have passed us as quickly as it arrived. This is to document that moment as we continue to think about ways to provide more opportunities for more children to have access to places in the community where they can learn about the game of basketball and play. And this goes out to all children, boys and girls regardless of ability or skill. At the end of the day every1plays is about helping parents find those opportunities for their children and doing so in the most cost effective way possible. Special thanks to everyone mentioned in this write up. We’re hopeful for future ideas and simply the joy children experience playing hoop as they continue to dream about their next standout game, making the school team, playing beyond graduation, and who knows maybe even having the chance to give back to their communities as coaches or professionals of the game.